Click on the cover to read. When it comes to Truth, many people prefer temporary feelings over Truth. Ever hear of an addict, alcoholic or even a cigarette smoker? All three know the Truth is they are killing themselves. However they prefer temporary feelings over Truth,The problem is that the Truth eventually surfaces, regardless of how much we try and deny it. If we ignore it too long, Truth will destroy us. Jesus did not say he had the Truth. He said - I am the Truth in John 14:6. There is a huge difference. Truth applies to everyone, everywhere if they believe it or not. When the Bible says that God is not a respecter of persons. It is simply saying that Truth does not respect contrary beliefs. Take the time to read our interactive video linked e-book below. Learn why Christianity is the most reasonable belief anyone can hold based on the actual evidence. Nothing else is even remotely close. 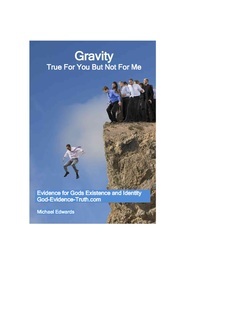 Click on the cover above to access "Gravity True For Your But Not For Me" Video Linked Online Version. Start links for the videos in the book require a double click to access the video.